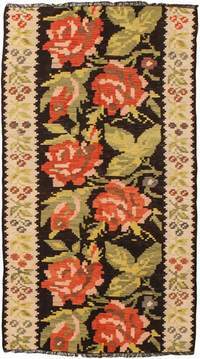 Bessarabian rugs are from the region of Bessarabia on the Western shore of the Black Sea that has been a part of both Romania and the Ukraine-depending on the political situation. The designs are often floral with elegantly drawn motifs and colors in earth tones. The style shows both French and Oriental influences. 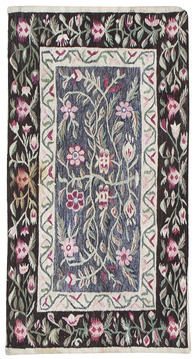 Bessarabian rugs rugs are almost always flat woven; the rare Bessarabian rug with pile is very valuable. 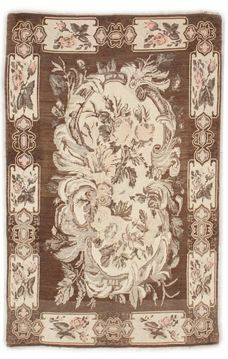 Bessarabian rugs are not as formal as, for example, Savonnerie or Aubusson rugs. Antique Bessarabian rugs in pile and tapestry technique occupy a unique place among European carpets. Produced during the late nineteenth and early twentieth centuries under late Ottoman Turkish rule in an area corresponding to modern Bulgaria and Romania, they stand right on the cusp of European and Oriental carpet weaving. Many of the designs are floral patterns made in a naturalistic western style utilizing brown or black ground, not unlike certain Karabaghs from the Caucasus. But others, particularly flatweaves, reflect the tradition of Turkish kilims from nearby Anatolia, although in a distinctive Bessarabian palette. In either case they are supremely decorative pieces.